Give your immune system a natural boost! A CBD+ oil is a vegetable oil mixture containing an olive or hemp seed oil and a biologically produced fresh hemp extract, also referred to as CBD paste. This paste is the pure product and has not undergone any unnatural treatment. 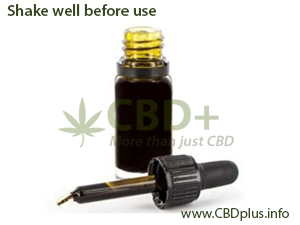 CBD oil drops are safe to use according to your own requirements. In terms of helping the body to function better, it is evident that CBD offers enormous support and it has an immediate and positive effect on our health. It also provides support in connection to various diseases and relieves nervousness, tension and pain. How do you use CBD+? CBD+ Oil is a food supplement. So it is safe for ingestion. You use the oil by administering it in drops under your tongue and you wait a minute before swallowing this. Many people start by using two drops three times daily. After a few days or weeks you can feel whether you need more, or perhaps less. Already after a few days I started to notice my pain became less intense. I am very content with this oil, aspecially because it’s an organic product. I’m happy that it’s available in stores. Last December, I suffered from a hernia. If problems arise and tension builds up in my back area, I usually take diclofenac. Now I use CBD (3 x 2 drops a day) and I no longer need the pills. I am very happy with this product and it’s also nice that a well known company like Jacob Hooy produces it. We – Gwenn and her owner – are super happy with this CBD oil. Our homeopathic vet recommended it. It really works for pets too! A food supplement must not be used as a substitute for a varied and balanced diet or a healthy lifestyle. Use: At room temperature, it can also be heated slightly, make sure you shake well. Use a few drops under the tongue 2-3 times daily. Maximum 15 drops per day. Keep the oil in the mouth for 1 minute before swallowing. Gradually build up the dosage, the amount differs from person to person. Do not exceed the daily recommended amount. Warning: Keep out of reach of children. Do not use during pregnancy and breastfeeding. The oil’s CBD content of 2,75% is the ideal quantity.